it probably has other benefits, too. Tissue lipid turnover, adipose vs. liver. Can the saturated fat & MCTs in dark chocolate & coconut oil protect liver against the ravages of alcohol? Tonight? The studies discussed in “The liver is evil but need not be punished. SFAs” entailed chronic alcohol feeding in combination with a high saturated fat/MCT diet – the animals were given a liquid diet of complete nutrition and a LOT of booze. Not very applicable to humans, imo [hopefully]. Which brings up the question: how long does it take for coconut oil & dark chocolate to flex their hepato-protective muscles? 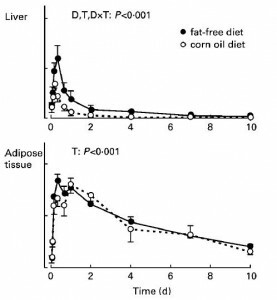 Fortunately, [if tissue fat composition is in fact the relevant protective factor], unlike adipose fat which hangs around for years (Beynen et al., 1980 & Katan et al., 1997), liver fat appears to turn over quite rapidly. For example, a single shot of radiolabeled oleate is cleared out of the liver within a few days, whereas it lingers significantly longer in adipose of rats (Iritani et al., 2005). And this is actually enhanced in rats fed a higher fat diet. Translation: while a single meal of dark chocolate and coconut oil may not acutely protect the liver from alcohol [tonight], a few days’ worth just might. Red meat. 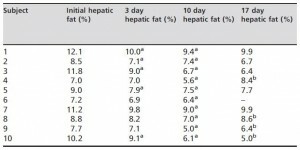 While the saturated fat content of red meat is expected to similarly bolster liver resistance to oxidative stress, another component – carnitine (of the recent TMAO infamy) – may also provide some benefit by enhancing liver fat turnover (Kepka et al., 2011 sorry no full text, so only in theory). Taurine , also found in red meat, also prevents some alcohol-induced liver pathologies [in rats] (Kerai et al., 1998 & Pushpakiran et al., 2005). Coffee, too (Gallus et al., 2002; Tverdal et al., 2003; Klatsky et al., 2006; Lopez-Garcia et al., 2008; Sugiyama et al., 2010). Probably has more to do with prevention of lipid peroxidation via antioxidant polyphenols. just sayin’ …compared to the SFA’ers, would those on a high PUFA diet benefit more from coffee in this regard? The culprit isn’t red meat or TMAO, its cigarettes & sedentary obese HFCS PUFA empty calories – the bona fide confounding factors in most anti-nutrition propaganda. 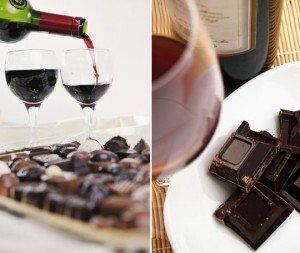 This entry was posted in Advanced nutrition, chocolate, coconut, diet, Dietary fat, fat, wine and tagged alcohol, calories proper, chocolate, diet, empty calories, high fructose corn syrup, nutrition, wine. Bookmark the permalink.